In previewing week eight, I called the Cowboys match up a “show me” game. In other words, show me something that should give some hope that the Eagles can actually accomplish what will be an uphill battle to the playoffs. They certainly didn’t answer all of my questions, but the 34-7 trouncing of the Dallas Cowboys was nothing if not proof that the Eagles can play at an elite level. Let’s break down the win. 7 = Number of receptions by Brent Celek, more than in the last three games combined. 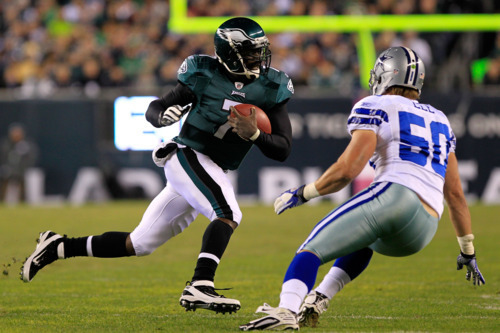 Jason Avant also had a big day, as Michael Vick torched the Cowboys over the middle of the field. Celek noted after the game that Dallas often lined up in deep Cover Two formations to prevent the big pass play. The formations worked, in a sense, but the Eagles picked them apart underneath those safeties. 13 = Straight wins after the bye for Reid. Looked like he was one step ahead of Ryan the whole game. 100% = Eagles “Drive Success Rate.” Football Outsiders says that the Patriots have the highest rate in the league of drives with either a first down or touchdown, at 79%. The Eagles accomplished that on every drive Sunday night. The offense also converted more than half of their third down chances for the first time this season since week one. 88% = Cowboys “Drive Success Rate.” Oddly enough, the Cowboys offense also scored well against this metric. Of course, only in their final two drives did they manage to reach a third set of downs. 9.3 = Rushing yards per attempt by DeMarco Murray on 8 carries. The Eagles defense had a great day, its best against a quarterback not named Grossman. But there were still some problems that didn’t look fixed. Murray had no problem gashing the defense when he had the ball in his hands. Poor tackling was still an issue from Jamar Chaney and others. Kurt Coleman also allowed a ghastly 70 yard touchdown pass to Laurent Robinson. Perhaps the truest thing that can be said about Sunday’s victory was that the Eagles won the way they are built to win. This team was constructed to jump out to big leads and then force the opponent to comeback against a relentless pass rush and Pro Bowl cornerbacks. Howie Roseman and Reid essentially had this performance in mind when they made all those offseason changes. We’ll see if that revived blueprint can hold going forward. Tagged with Philadelphia Eagles, NFL, Week Eight, Dallas Cowboys, Michael Vick, Brent Celek, Jason Avant, Offense, Cover Two, LeSean McCoy, Andy Reid, Rob Ryan, Football Outsiders, Drive Success Rate, Defense, Jamar Chaney, Kurt Coleman, Bye Week. October 31, 2011 by Brian Solomon.